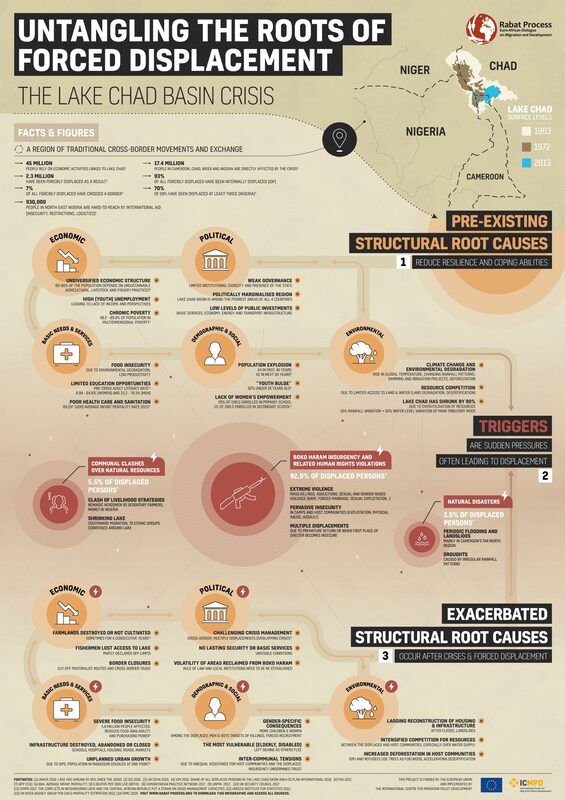 The Lake Chad Basin Crisis Infographic | rightcolours. The Lake Chad Basin Crisis Infographic. The Lake Chad Basin humanitarian emergency is among the most severe in the world. 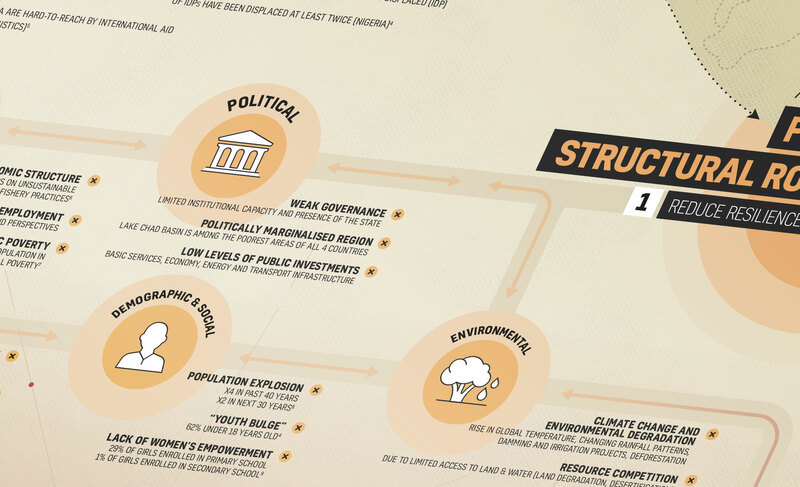 Commissioned by and in cooperation with the International Centre for Migration Policy Development (ICMPD), we have created a comprehensive infographic that aims to alert and educate about the structural roots of the crisis and its main triggers. Forced displacement is a complex phenomenon that can be traced back to a multitude of interlinked root causes and triggers. The protracted humanitarian crisis unfolding in the Lake Chad Basin has led to one of today’s major forced displacement crises. Since 2013, it has already caused the displacement of over 2.3 million people - within and across state borders. The Boko Haram insurgency - one of the most well-known and major causes - is not the only responsible factor. 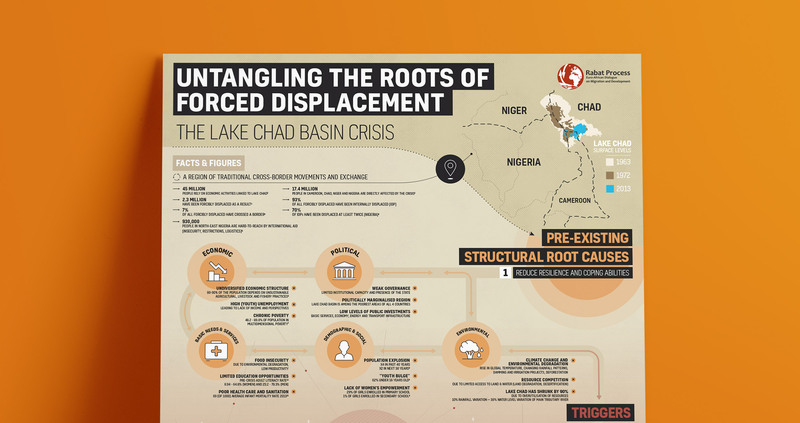 This infographic aims to untangle the complex root causes and triggers responsible for forced displacement in the Lake Chad Basin. The International Centre for Migration Policy Development (ICMPD) turned to Rightcolours for help capturing a vast amount of research they have been collecting into one comprehensive infographic that would visually convey the complex interplay of various variables of the crisis. Our main challenge was to create a single piece of design that would visually simplify the interrelatedness of various root causes and crisis triggers without to loose the detail required to understand the big picture. 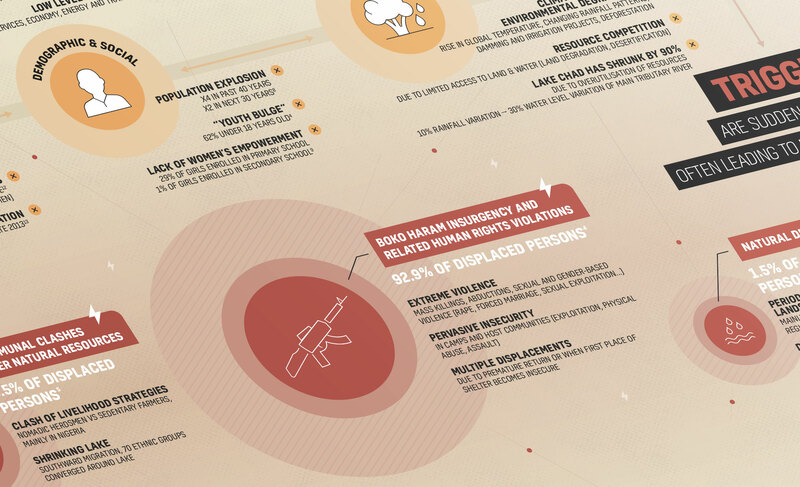 The final infographic was also translated to French and intended to be used as a large A1 printout that would be presented at various thematic conferences of the Rabat Process Secretariat.